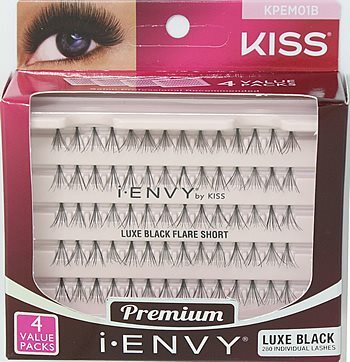 KISS i-ENVY Luxe Individual Black SHORT Multi-Pack (KPEM01B) contains 4 packs of Kiss i-ENVY Individual Lashes LUXE Black Short. Individual Lashes LUXE Black Short are darker individual flare clusters that add definition, depth, and luxurious volume to your eyes as desired. The “Mini Knot” technology allows for a more natural look at the lash line. 1. Using lash adhesive remover or baby oil, moisten cotton swabs and gently massage over lashes.